This is the dual-band Pro version (12W/30dBm) of the standard range UniFi AP, sold separately as part 202 0332. 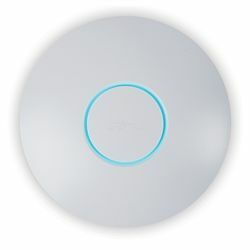 The clean design of the UniFi AP-Pro 802.11b/g/n access point seamlessly blends into typical home and office environments. With 450Mbps dual-band MIMO technology and a range of up to 400 feet, the access point includes everything you need to install and manage it. Dual Gigabit ports and Power over Ethernet Gig E functionality make for both a cleaner and easier install. Configure and manage any and all UniFi access points with the included easy-to-use controller software. Includes mounting kit, PoE injector, power cord and CD-ROM with software. Management station requires Microsoft Windows XP+ or Mac OS 10.4+.